With the influence of Pinterest – it seems everything we do in the wedding journey from finding our wedding dress to our wedding table setting is inspired by the latest pin! Even a task as simple as asking your best friends or family members to be your bridesmaids has turned into a creative event. So here at Lilac Rose Bridal, not only do we strive for uniqueness in our wedding dress collection but we love to be that little bit different in all things wedding so we combined 5 creative ways to ask your girls to be part of your special day! The most simple and elegant way to ask; there are literally thousands of adorable designs available online. Print your own or order a bespoke card, and write a sweet message inside letting your best girls know exactly how much you love them, and why you can’t wait to have them standing at the altar with you! When does a special occasion not call for balloons? Fill them with glitter confetti or present your friends with deflated balloons that display the words; ‘Will you be my Bridesmaid’ when blown up. There are plenty of ways to surprise your girls and with the message inside the balloon! A photo frame is really sentimental idea; pop in a picture of you and your best mate having the time of your lives and she has a keepsake forever. 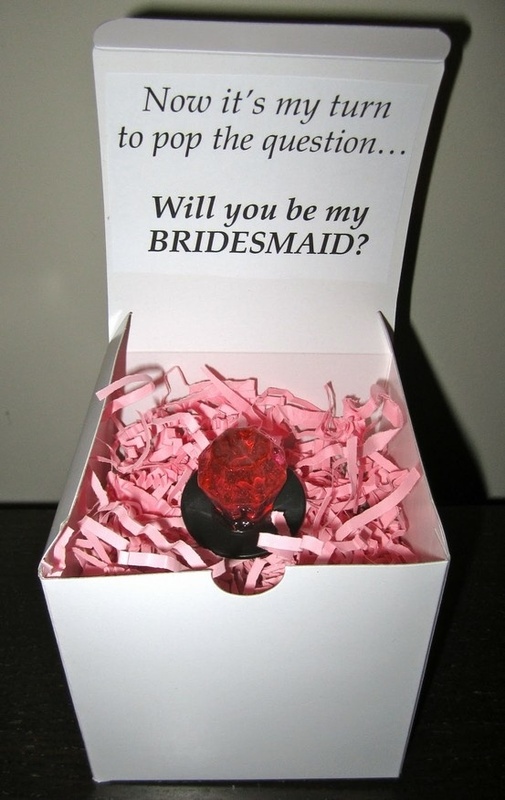 One of the simplest but best bridesmaid proposals! As a bridesmaid a lot of wine is drank and I mean A LOT so why not start off as you mean to go on by gifting your bridesmaids a personalized wine bottle? Stray from convention with a quirky label like this bride or simply include a photo of the two of you together with a short, sweet message. 5. And last but not least our Favorite… ring themed sweets! Everybody remembers getting married when they were six with a Haribo ring. This idea is perfect for childhood best friends who shared that time in your life with you! Pop the question to your bridesmaids with a ring pop or get creative with other ring inspired sweets.